The State Weather Bureau reported earlier that the low pressure area was now inside the Philippine area of responsibility and they assigned a codename 'Luis.' The new Tropical Depression was spotted at 780 kilometers east of Virac, Catanduanes, according to 11:00 AM today advisory. PAGASA released a weather forecast that Bagyong Luis is not yet affecting the Philippines but its continuously moving to west northwest at 26 kph. 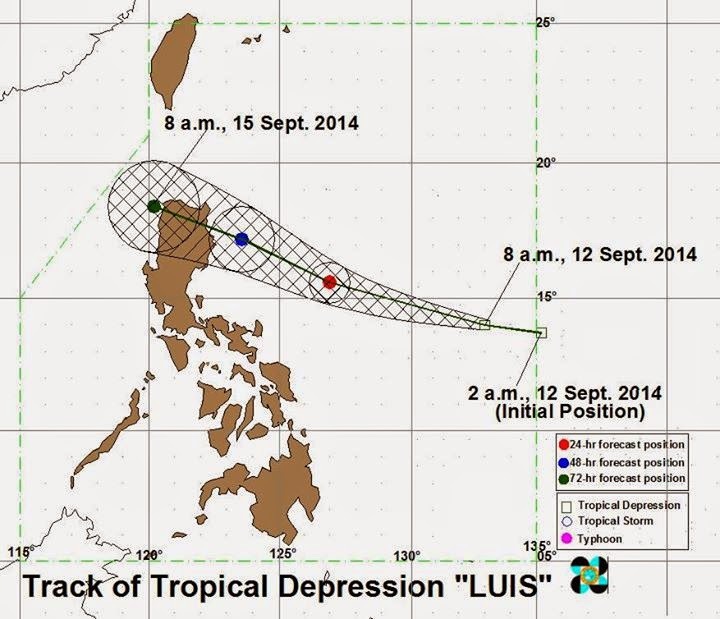 And as of writing this weather advisory, the Tropical Depression “LUIS” has slightly intensified over the Philippine Sea. The strength of the maximum sustained winds has a 55 kph near the center. According to PAGASA, Bagyong Luis is expected to be at 70 km West Northwest of Laoag City by Monday morning. The next weather bulletin will be post later at 11 PM today. For more information about the Bagyong Luis inside the PAR , kindly bookmark this page and share to your joined social networking sites. Comments or suggestions about "PAGASA Update: Bagyong Luis inside the PAR (September 12)" is important to us, you may share it by using the comment box below.